We’ve added a new field to the Add Bookmark page called “Category”. The purpose of this is so that we can start sending bookmarks to social bookmarking services that require categories. There’s quite a few of them so this opens up a lot more possibilities for integration. We strongly recommend that you update your existing Bookmarks. 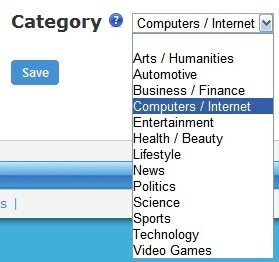 If you don’t then we won’t be able to send your bookmarks to any site we integrate with that uses categories. So any time anyone Shares your bookmarks you’ll be missing out on potential backlinks. If you can’t find a category that’s a perfect match for your bookmark, just pick the most appropriate one. This new functionality is the v2.15 release.